Home / Flying Squirrels / How to monitor the FS3 Balloon Telemetry. 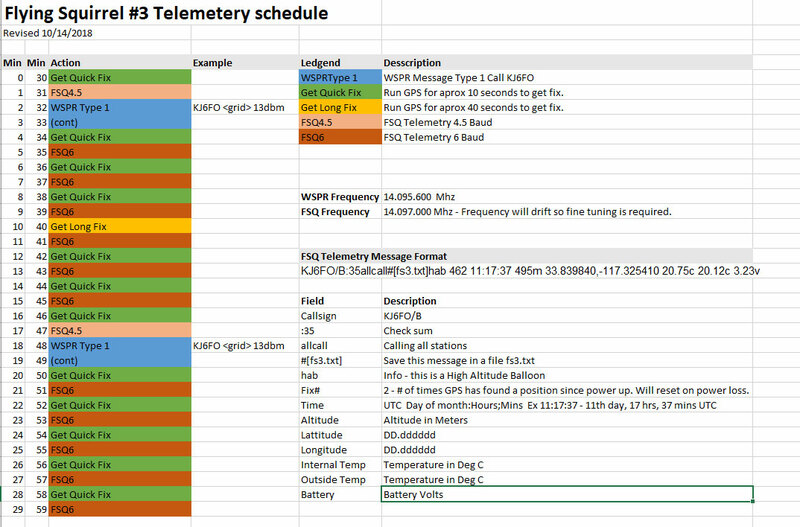 Flying Squirrel #3 will send telemetry data according to the schedule below. On most odd minutes of the hour, telemetry will be sent via the FSQ protocol on the 20 meter frequency of 14.097.000 Mhz. In order to decode this telemetry data, you will need a receiver that can tune to the FSQ frequency in Upper Side Band mode (USB). Individual radios may drift or be slightly uncalibrated, so fine tune as necessary. You are listening for a 5 second tone followed by a series of tones, with an almost musical quality to them. To decode the FSQ telemetry data, I recommend using a program called FSQCall. This program is simple to set up and run. Just Unzip the file into a folder and run the .EXE from there. When starting the program, you will see two dialog boxes related to Rig Control via the serial port, just dismiss these two dialog boxes and then the main screen will appear. Consult the telemetry schedule for the next FSQ time slot and then wait. At the start of telemetry, FS3 transmits a 5 second carrier tone. Fine tune your receiver until the line in the waterfall display lines up near the 1 in “1400” at the bottom. Following the 5 second tone, the FSQ data will begin with a series of tones. Four times an hour at 2,18,32,48 minutes past the hour FS3 will transmit a WSPR beacon (The 4 Digit Grid Square kind). Each WSPR beacon lasts a little less than 2 minutes. FS3 uses the standard 20 meter WSPR frequency of 14.095.600 Mhz. Use the WSJT Software to decode the WSPR beacons. The callsign will be KJ6FO. You can also look for the callsign KJ6FO on the WSPRNET website . Set the Map settings to 20meters, Callsign to KJ6FO and Time Period to 1 Hr.